In 2009, Radiohead released a song called "Harry Patch (In Memory Of)." It was only sold online, and was about the last surviving British veteran of World War I. Then in November, the dude from the Fiery Furnaces went on an anti-Radiohead rant, which included some attempt at being clever about how stupid it was they wrote a song about Harry Partch. Partch is an experimental composer and musician. He concluded his rant by saying "I'd make fun of Beck too, but I'm afraid of Scientologists." OK? Since the only good part about the Fiery Furnaces is this guy's sister, Eleanor, most people were like "wtf!" and shrugged it all off as a lame attempt at being provocative. 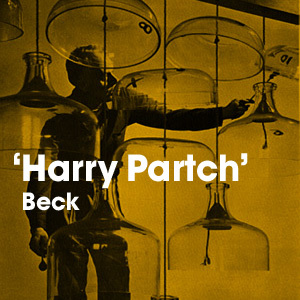 Except Beck, who promptly recorded a song in tribute to Partch and put it on his website. It's entirely insane (check those lyrics!) and is similar in a way to the "Brandon Nevins" jam. A thruway from the external to the internal, in tribute to California bred composer Harry Partch's concept of 'Corporeality'--- the integration of the body with all art forms. The song uses a 43 tone scale in reference to Partch's innovations with alternate tonalities. A peregrination across disparate territory to ascertain an unassumed frame of reference. I do not know if this 10.5 minute track actually uses 43 tone scales or not. There are a few references to actual Partch biography, at least. The opening lyrics reference a bunch of instruments Partch invented (he made his own instruments! ): the Quadrangularis Reversum, Kitharas, Zoomoozophone, Zymo-xyl, Mazda Marimba, Zoraoastrian Z, the Chromelodeon (sic), and Cloud Chamber Bowls. Later, Beck had Eleanor Friedberger sing on his Song Reader CD (she did "Old Shanghai").